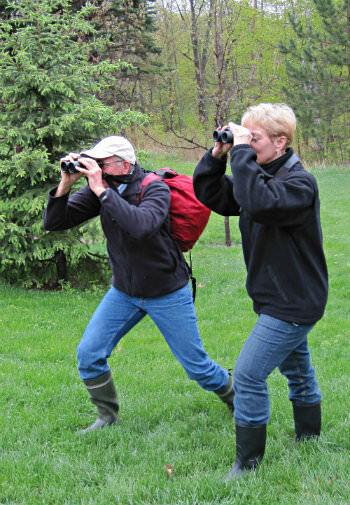 Some of the best birding in Minnesota, year around, is right outside our windows at Woodland Trails Bed and Breakfast. Starting each morning before sunrise, and continuing all day, birds that visit the feeders offer endless entertainment. 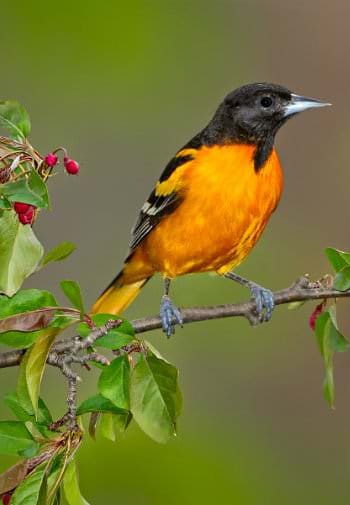 During your Minnesota vacation, take some time to bird watch here at Woodland Trails Bed and Breakfast, at Crex Meadows Wildlife Area in Northwestern Wisconsin, and at Hawk Ridge Nature Reserve in Duluth, and add some bird sightings to your life list. 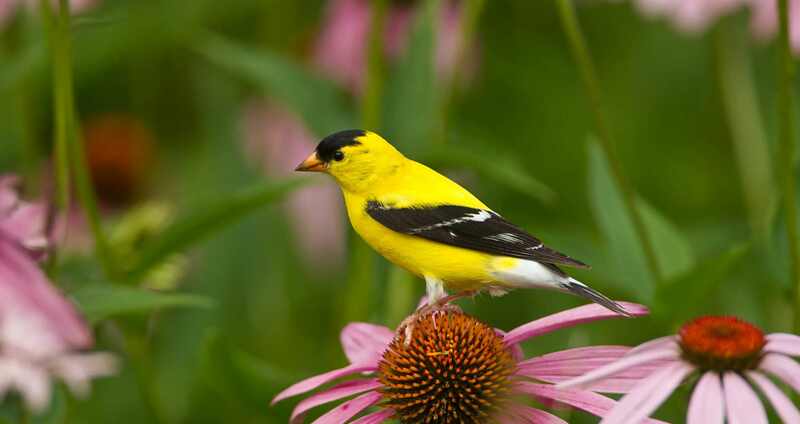 Species that visit the sunflower feeders include gold finches, nuthatches and chickadees. How many species of woodpeckers have you seen? 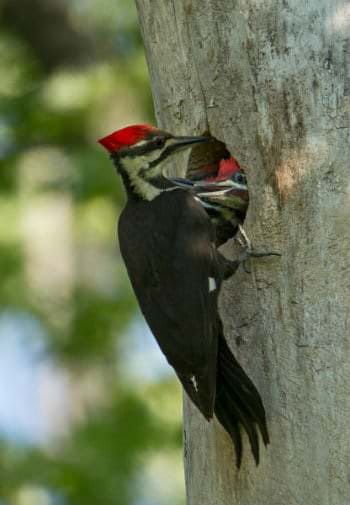 At Woodland Trails Bed and Breakfast’s suet feeders you are likely to see downy, hairy and red-bellied, plus the Woody Woodpecker look-alike, the pileated woodpecker. From mid-May through mid-September, tiny hummingbirds amaze guests as they land on a feeder right outside the window. Also from spring through early summer, enjoy watching the wood ducks come to the deer feeders every morning and evening. 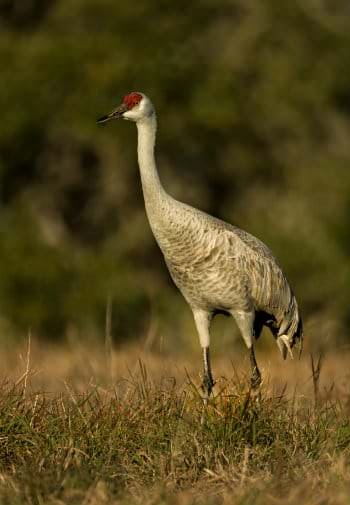 For a PDF checklist of birds that occur in nearby St. Croix State Park, most of which also occur on Woodland Trails Bed and Breakfast’s land, click here. The Crex Meadows Wildlife Area is located in Northwestern Wisconsin, less than 30 minutes from Woodland Trails. Visitors are drawn to its plentiful wildlife and unique habitat. These visitors can experience a variety of wildlife recreational opportunities, such as wildlife watching, guided tours, and hiking in this 30,000-acre preserve. The Crex Meadows Wildlife Area is located in west central Burnett County, one-half mile north of the Village of Grantsburg. From Woodland Trails, a 30-minute scenic drive down Burnett Country Road F takes you to Crex Visitor Center. Click here for a PDF map of Crex Meadows. Click here for more information on Crex Meadows. The Hawk Ridge Nature Reserve, located in Duluth, Minnesota, provides some of North America’s best autumn hawk watching. Migrating raptors, originating from summer breeding areas as far north as the Arctic and with wintering destinations as far south as points in South America, concentrate in impressive numbers at the western tip of Lake Superior. Most raptors are reluctant to cross large bodies of water. When they migrate south and encounter Lake Superior, the birds naturally veer southwest along the lakeshore. They concentrate in impressive numbers on the bluffs overlooking East Duluth and can be easily seen from the overlook at Hawk Ridge. Of the 20 species of raptors and vultures that have been seen at Hawk Ridge Nature Reserve, the peregrine falcon and gyrfalcon are among the rarest. Whether species are common or rare, they are all thrilling to watch as they traverse the ridge, often at or below eye level. On days with northwest winds, a few hundred to several thousand birds can be seen migrating past the Ridge. Most winds with a westerly component will produce large numbers of migrating hawks. Southerly or easterly breezes do not generally produce as large flights of raptors but often the birds are lower and easier to see. Beginning in mid-August with American kestrels, sharp-shinned hawks and broad-winged hawks, migration continues into December with the last of the red-tailed and rough-legged hawks, northern goshawks and eagles. Peak migration at Hawk Ridge occurs from mid-September to late October. Click here for more information on Hawk Ridge.